More on fishing laws, 1915. A LAW PROTECTING FISH IS WANTED. There was a petition carried around to the citizens of Kaneohe, Heeia, and all the other areas on the Koolau side of the island of Oahu which asks the legislature to pass a law prohibiting the Japanese fishermen from going into those areas with their small-meshed nets and indiscriminately taking all kinds of fish from those waters, so that fish will be left for the people of those Koolau cliffs. In times past, there was an abundance of fish seen in those waters, and the Hawaiian people of the place were greatly blessed, in that fish were easily caught making life easy because of this bounty of fish; however, these days, it is changed, because with their huge nets which are 600 feet or more long, the Japanese go about, and being that the eyes of their nets are tiny, caught haphazardly are all sorts from big to small; and these day you hardly see fish that were regularly seen before. Desperately Wanting a Law Passed. It is hoped by a great number of the people of the (two) Koolau that a law is passed soon by the legislature banning the Japanese from fishing in those waters with nets, because it will save the fish from being wiped out by the Japanese, and fish will be left to propagate for the benefit of the people of the entire island. One very good law being worked on by the legislature, is the limiting of fish prices, because when you observe the selling of fish in fish markets of Honolulu nei these days, the prices are so high that the poor and indigent can’t afford it. 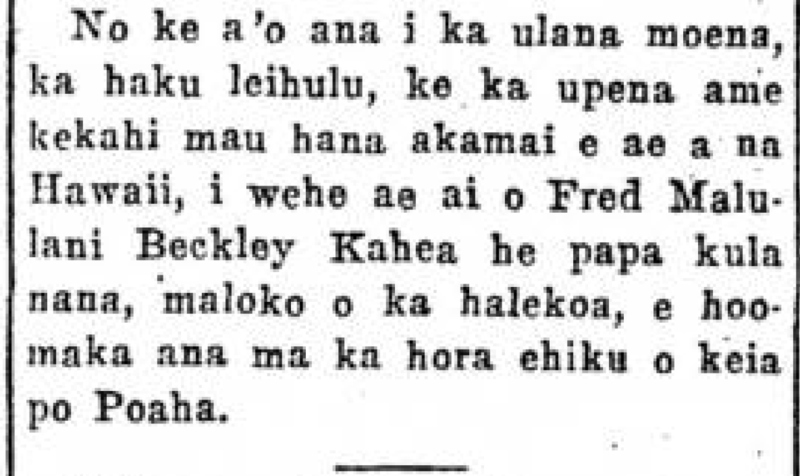 Ka Nupepa Kuokoa, Buke LIII, Helu 8, Aoao 2. Feberuari 19, 1915.